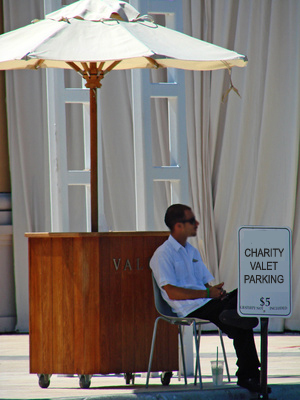 Valet parking has been around as a business for quite some time. In contrast to "self-parking," where customers find a parking space on their own, you will be parking their cars for them. As a charity fundraiser, you will provide the same service as a professional valet parking service: allowing people to drop off their cars, collecting their valet fees (donations), providing them with a claim ticket, and then parking their cars for them. After the dinner or activity, you’ll retrieve the vehicles and return them to the owners. To operate this fundraiser, you’ll need to find a busy restaurant, mall, or area event, and then get permission for your charity to perform the valet parking service over one or more weekends. Generally, the service will be viewed as a plus for the restaurant, mall or special event, once you get past the initial checks: the quality of your drivers, your ability to operate the service, and showing proof of any permits, insurances and licenses required to operate this type of service. You’ll need to come up with a way to individually identify each set of car keys with the vehicle, the owner and the space where you parked the car. You’ll need to give the car owner a matching identification claim check for retrieving the car. And you’ll need a large plywood board with plenty of hooks or nails to hold the car keys. Picking a location will be the next challenge. We’re all used to seeing valet parking in busy urban locations, where parking is pretty scarce or very restricted. This might be a bit challenging for a group inexperienced with valet parking. Maybe a venue where there is parking on the premises is a better choice for the first go-around. Make sure you lock the vehicles and hide any devices that are theft-magnets, like portable GPS systems. If possible, have a volunteer permanently stationed by the parked cars, and equip them with a cell phone or walkie-talkie. And there should also be a volunteer stationed permanently with the car keys, to ensure they’re safe. Some of the more unusual places to consider include hospitals (during visiting hours), movie theaters, churches, fairs, special events, and main entrances of malls – especially during the holiday season. Ask the owners or operators if you can cordon off a section of their parking area or structure for your use. Ideally, you want drop-offs and pick-ups to be staggered, unless you’re providing coffee and donuts to a line of church or theater goers who are waiting on their cars to be returned. Think about how you can speed the retrieval of the vehicles. If you’re working with a restaurant, suggest that the customer give the waiter the claim ticket number when they pay the bill. In turn, ask the wait staff to notify you. If you’re servicing the main entrance to a mall, then give the customer a cell phone number to call, and suggest when they should make the call to give you time to retrieve their car. Consider leaving a brochure, gift or donation envelope in each car that explains your mission and your appreciation for their participation. Generally, it will be the convenience of your service, more than your cause that will get the customers. But never underestimate the connection of a health charity with a hospital, or a pet rescue program with an animal show. Patrons of one are likely to be sympathetic supporters of a related cause. Source of Idea: The author could not find any examples or identify a source to credit.